Regulatory circuits play crucial roles in the dynamical behaviour of a system. Indeed, positive circuits are required for the existence of several attractors, whereas negative circuits may generate cyclic attractors Thieffry2007. Many regulatory graphs currently under study contain a large number of circuits, but a relatively small number of them often plays a more important role. In Naldi2007, we describe a method to compute a functionality context for all circuits, to determine which circuits are more likely to affect the attractor configuration of the system. Note that the functionality contexts identified here give the conditions on the immediate regulators of the circuits under which it is fully effective. These conditions may be impossible to maintain according to the dynamical rules of the model, especially in the case of model perturbations. The Circuits Functionality entry of the Action menu opens the circuit analysis dialog. 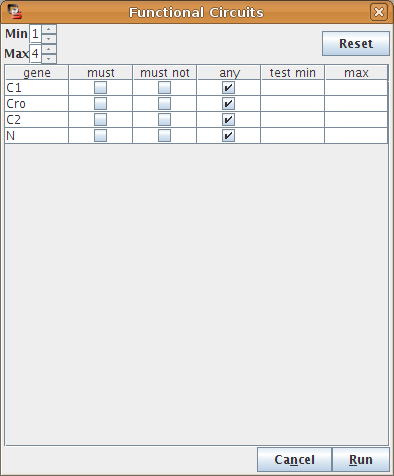 This dialog provides a interface to lookup all circuits in the regulatory graph or a subset of circuits matching some filtering rules (length, involved components). A first dialog enables to select which circuits will be analysed, by specifying constraints on the length of the circuits or on the involved actors. By default all circuits are considered. The dialog then allows to analyse the selected circuits, it will then show the circuit for which a functionality context was found. The analysis can be repeated for various perturbations. When the analysis is completed, the dialog classifies the selected circuits, according to their computed sign. 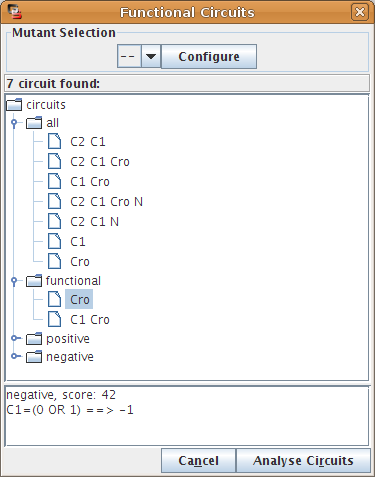 When a circuit is selected, its functionality context is shown at the bottom of the dialog box.